Natural gas in Bolivia is one of the nation's main energy sources and export products. 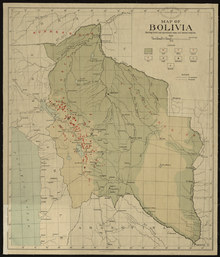 Bolivia's proved natural gas reserves are estimated to be 24,800,000,000,000(ft³). Most of these reserves are located in the eastern region of the country. The major export pipelines in Bolivia transport the gas to Argentina and Brazil.